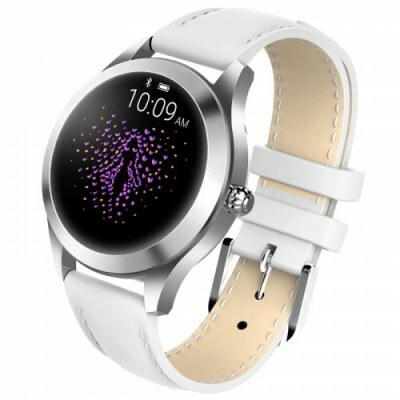 The smart KINGWEAR KW10 smart watch became a real gift for girls and women in 2019. This is the first model from Kingwear company, which was designed specifically for the beautiful half of humanity. The Kingwear KW10 is equipped with a 1.04-inch color screen with 5 dynamic dials. Under the hood is the nRF52832 processor, which is quite energy efficient at good performance. As for the functions, the watch can perform almost all the tasks typical of fitness bracelets. The KW10 watch will be an indispensable companion. The model is lightweight, compact and fits comfortably on the arm. The functions of the clock are far from being limited to viewing the time. Simply connect it to your smartphone to get a range of very useful functions. The Kingwear KW10 allows you to receive and make Bluetooth calls without having to reach your smartphone. You can also receive notifications from all social networks and other applications, e-mail, SMS. Built-in reminder function and alarm clock will be very useful in everyday life. If you like sports and take care of your health, the built-in heart rate monitor and pedometer will be a nice addition. Keep track of your activity, number of steps taken and heart rate with it. This model also has a built-in women’s calendar. You can easily monitor your cycles. The Kingwear KW10 has all-in-one interchangeable dials. You can change them according to your mood. An integrated 120 mAh battery allows the watch to be used without charging for up to 12 days. Waterproof to IP68 standard, so you can keep your watch on even while sailing.